If you're a citizen of the United States, and you're thinking about traveling to Mexico, but you don't yet have a passport, you might consider getting a passport card instead of a regular passport book. You should know that the passport card is only valid for travel by land and sea within Mexico, Canada, Bermuda, and the Caribbean, and you can not use it for air travel or for travel to other parts of the world. The passport cards are ideal for those walking or driving across the border frequently or visiting the Caribbean and Bermuda by boat. If you may decide to travel by air or to other areas in the next few years, you may find it's more practical to apply for a conventional passport rather than a passport card. 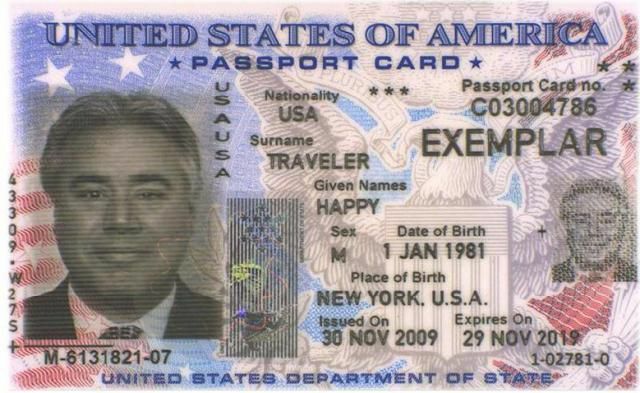 When the Western Hemisphere Travel Initiative was brought into effect in the years following 9/11, travel documents began to be required to cross borders between the United States and its neighbors. As a measure to make things easier for travelers, particularly those who cross the border frequently, the passport card was introduced as an alternate form of identification. The passport card is a wallet-sized identification card that proves US citizenship. It is an alternative to carrying a conventional passport book and is valid for land and sea travel to and from Mexico, Canada, Bermuda, and the Caribbean. The passport card is not valid for air travel except domestically within the U.S. and is RealID compliant for that purpose. The passport card contains an electronic chip that allows immigration officials to access the card holder's biographical information. The chip itself does not contain personal information, it simply allows border officials to access the information which is stored in a secure government database. The main advantages of the passport card are its cost and practicality. The passport card costs considerably less than a conventional passport, $65 for the first card, which is valid for ten years, as opposed to $145 for a passport. For children, the cost is $50 for a card that is valid for five years. Because of its small size, the passport card will fit in your wallet, as opposed to a passport book which can be impractical to carry around with you. Passport cards are particularly handy for people who live close to the border and cross frequently or people who rarely travel but have decided to go on a cruise in Mexico or the Caribbean. The disadvantage of a passport card is that you can not use it for air travel (except domestically), so if for any reason you need to cut your trip short or experience some type of emergency during your trip and need to get home as quickly as possible, you won't be able to just take a plane, but would have to return by land or sea, or get an emergency passport. Also, if you decide to travel to other areas of the world, or decide to travel by air at some point in the future, your passport card will not be valid and you will end up having to get a regular passport book anyway. The application process for a passport card is very similar to applying for a passport. You will need to fill in an official form and present identification and proof of citizenship. Here are more details about how to apply for a passport card: get a passport or passport card. The U.S. Department of State has a simple-to-read list of facts comparing the passport card with the passport book and providing links to applications for both.